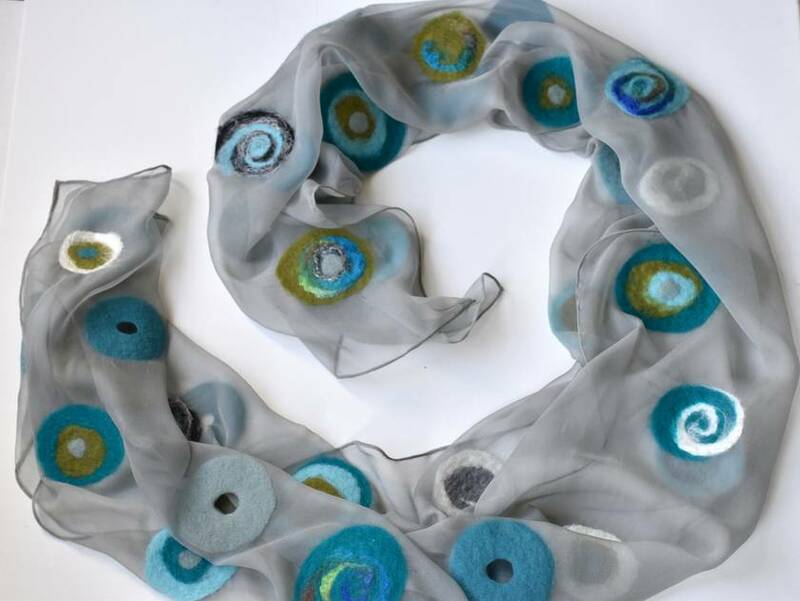 Fine NZ merino wool fiber and some dyed or white strands of silk fibres were felted in a whimsical pattern of dots on a grey dyed pure silk chiffon scarf, an elegant, sheer silk fabric with a beautiful translucent drape. Some of the dots were perforated with a little whole surrounded by felted wool from both sides as a special design feature. 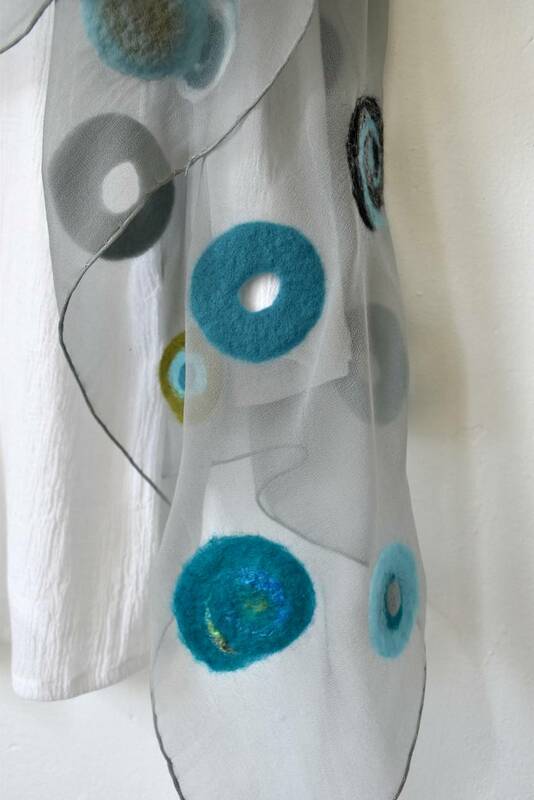 This beautiful hand crafted silk and wool scarf will complement and decorate your outfit at any season. 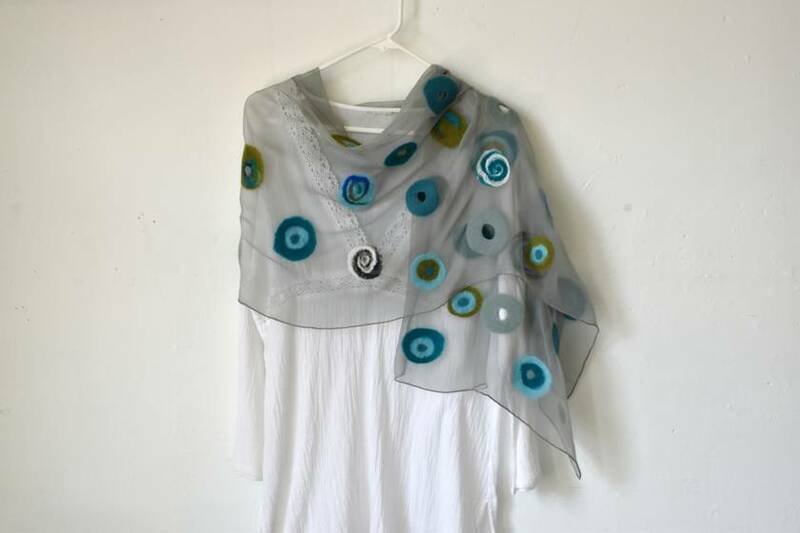 Can be worn in a various ways : as a stole, scarf , shawl, wrap for those summer evenings and special occasions. Approx 50 x 170 cm, 20 x 67 "
Comes washed, ironed and ready to gift or wear in a black or white gauze bag with drawstring ( silk/felt care instructions included). * Important notice! 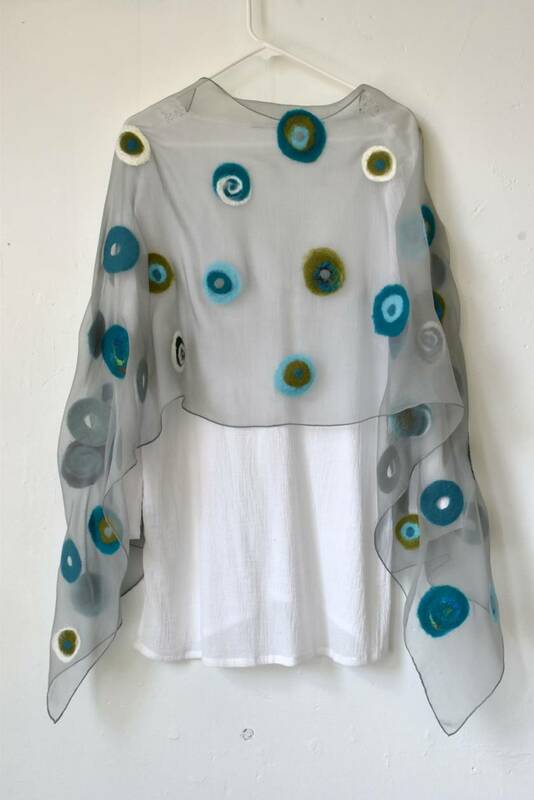 -> Because this piece is a one-off and can't be repeated, send me a message first before you order , please, so i can hold it for you in order to avoid, that this item was just sold ( e.g. in my studio) at the time of your order. 1 . Dispatch time - All items,except made to order, are shipped within 1-3 business days after receiving your deposit. Delivery time within New Zealand is usually 2-5 days. 2. I ship worldwide from New Zealand as NZ post International air parcel (untracked). If this item was sold in my studio the same day you order you'll be noticed ( i can only check my e-mails at nite from home , not at work). I can usually make a similar scarf within 5 working days.e the additional cost for you. - Delivery target is about 3-10 working days (sometimes e. g around Christmas time ! up to 1 month) depending on your location. White tunic and coat hanger not included.